1. Sleigh Bells Ring—Are You Listening? Sure, you know the song, but here’s a chance to live it! 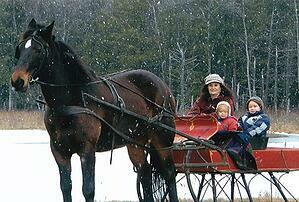 A Pocono Mountains horse-drawn sleigh ride is one of winter's favorite pastimes. You can take a ride through a winter wonderland of snow at Daisy Field Farm in the Poconos. Wrap up in a warm blanket next to your loved ones, inhale the fresh, pine-scented air, sit back and experience the spectacular scenery as you glide through the snow on a horse-drawn sleigh with the sounds of jingle bells in the air. Daisy Field Farm is a private family-owned horse farm and wildlife preserve near White Haven, PA. Click here for more information. If the frenetic pace of the holidays is getting under your skin, you may want to head over to Quiet Valley for a more peaceful celebration. Old Time Christmas Tours are a holiday tradition here in the Poconos. During the first two weekends in December, Quiet Valley offers guided lantern tours through their 19th-century farm. You can enjoy a live barnyard Nativity scene, listen to the carolers, and learn about farm life in the 1820’s. Then, do your holiday shopping and warm up with hot cocoa and cookies at the gift shop. 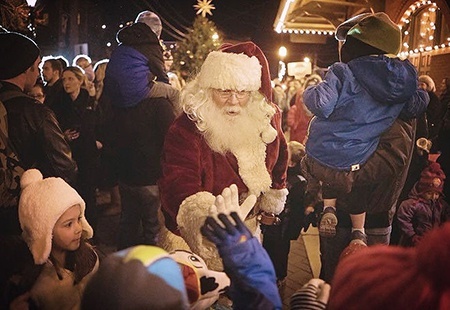 It’s the perfect way to celebrate Christmas in the Poconos! Click here for additional information. Another way to relax and enjoy the holiday season is simply to get away from it all. If that’s on your Christmas Wish List there’s no place quite like the French Manor Inn and Spa. You can experience the magic of Christmas in their enchanting stone chateau. They offer many holiday specials during this time of year, including the option to take home a Christmas tree or a festive wreath. And if you want to stay a little longer, they have the reputation for throwing one of the best New Year’s Eve parties in the Poconos! 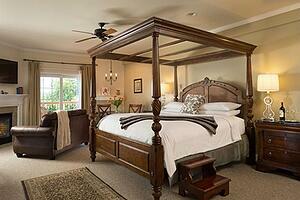 They offer 19 premium rooms equipped with the very best amenities. After a fun day out on the town, you can wind down with a relaxing massage or facial at their premium on-site spa. Check their availability and book your stay.